R. Narasimham, born in Irala village , Chittoor District, Andhra Pradesh and a post graduate in Social Work from Madras School of Social Work (1963 – 65) has been providing vocational counseling, vocational training and rehabilitation to persons with all categories of disabilities since January 1968. Retired as Joint Director from the Ministry of Labour, he supervised the Vocational Rehabilitation Centres for the Handicapped (VRCs) in India. Worked all over India (New Delhi, Kanpur, Chennai, Trivandrum, Ahmedabad, Mumbai, Bangalore and New Delhi). He is a pioneer in Vocational Rehabilitation in India and introduced several innovative rehabilitation programs for the benefit of pwd. As supervisor for the Vocational Rehabilitation Centres for Handicapped in the Country, he streamlined the functioning of the VRCs by designing a Manual of Procedures and developed “Signs for Tools” for use in training the deaf in vocational trades. Would have seen over 50,000 persons and helped over 15000-20000 in wage paid or self employment besides providing guidance to the rest. He was in charge of service delivery in the beginning and was involved in developing schemes, policy, budgeting, inter-ministerial interaction and participation in all govt. and Non govt. institutes for developing and designing schemes. He has been teaching for trainees in several courses of RCI and Schools of Social Work. Guided future professionals from Certificate level to post graduate and doctorate level in the field through teaching and mentoring. He is conversant with Telugu, (mother tongue) and English, Hindi, Tamil, Kannada, Malayalam, Gujarati and Marathi besides fluency in sign language used by the hearing Impaired. He was decorated with the National Award by the President of India for his services to the disabled in 1983 and by the Lions Clubs and Rotary Clubs on several occasions. Received the Lifetime Achievement Award from International Biographical Institute, U.K. in 2004. A consultant on the Rehabilitation Council of India for manpower development is nominated as Chairman of the Committee constituted by RCI for developing courses on Vocational Rehabilitation, Rehabilitation Social Work and other placement, counseling activities. He was involved in developing course for M.A. in Disability Studies, Diploma in Vocational Rehabilitation (Mentally Retarded) and designed Diploma course in Vocational Rehabilitation (Across Disabilities) for RCI. His expertise is being used by several NGOs and government departments for streamlining, improving, evaluating and designing innovative ways of service delivery system and livelihood programs for the disadvantaged. He also teaches in several institutes conducting diploma, graduate and post graduate courses for future professionals in the field of disabilities. At present he is consultant with RCI and guides institutions in setting up facilities for the pwd, starting courses in rehabilitation in addition to taking up relevant Research Projects. 4 Vocational Rehabilitation of Disabled in India-Principles and Practice all over the Country and inter – ministerial interaction. Despite the Rehabilitation Council of India, a Statutory Body, having recognized this as a separate profession and including it in different syllabi for the different courses in rehabilitation, the Author has observed that there is no conceptual work based on Indian conditions in the field of vocational rehabilitation. The Author with his wide exposure to the different categories of disabled and having met and learnt from the pwd and seen in person, the issues and tribulations faced by the disabled, considered it a mission to give the experience back to the disabled, so that they can gain from the experience of others. What better way could there be, than training the professionals in the techniques so that millions of disabled could be helped? The Author has been sharing his experiences with the professionals belonging to the fields of social work, education, management and therapy of different disabilities. Some of those included in this effort are those papers presented in some National and International Seminars and some are based on the lectures prepared for interacting with the professionals/intended professionals. While medical intervention, education and therapy are based on disability with the family and society playing a secondary role, vocational rehabilitation is rooted in the society with disability being one of the variables along with several others such as poverty, gender, caste, literacy and backwardness. Disability compounds the effect of these variables in myriad ways towards wage earning capacities for the persons afflicted. The Vocational Rehabilitation Worker (VRW) should understand this shift in focus, when dealing with vocational rehabilitation and equip to provide all vocational services judiciously and professionally. The subjects discussed are therefore envisaged with components from diverse fields of psychology, special education, social work and business management. Some of these are concepts developed by the Author and theorized from the practical experience with the pwd with different disabilities and varied cultures and introducing innovative programs. As Head of different Vocational Rehabilitation Centres for the Handicapped in different parts of the country, the Author had the opportunity to experiment and succeed through these economic rehabilitation measures. Some of them such as Outreach programs (1974 – Delhi), Skill development (1976 – Kanpur), Training of Employment Officers in Disabilities (1978 – Chennai) Employer Oriented Training (1980 – Chennai), adjustment training (1981 – Chennai), Exhibition of Manufactured Products helped through Self Employment – 1981) Homebound Employment (1982 – Trivandrum), Community Based Vocational Training (1988 – Ahmedabad), Rojgar Mela, (Employer – Job Seeker Meet – 1990 – Mumbai), Teaching vocational subjects, to the deaf (who took the subjects in lieu of languages) (1994 – Mumbai), Development of lexicon for “Signs for Tools” (1995 – Mumbai), Worker Education for the Deaf (1995 – Mumbai), Group Employment and Self Help Groups (2003 – Bangalore) and even self employment (1976 – Kanpur) or supported employment (1976 – Kanpur), setting up cooperatives (1983 – Trivandrum) were all new concepts at the time. Now they have become part and parcel of the delivery system in vocational rehabilitation. The author organized at least two functions, including cultural and sports activities, every year to bring in variety of leaders as part of advocacy. Organizing and selecting a Team of locomotor disabled to represent VRCs at the All India Cricket for the Disabled (1992 – 96) was one way of bringing well known cricketers and exposing the abilities of locomotor disabled. Now it is an annual affair. It may also be seen that no mention of any particular disability has been made in this Book – deliberately – as in vocational rehabilitation it is the persons’ ability that counts and not any impairment or the resultant disability, the individual may face. Different variables in the job, work, work environment and environment restructuring to help the pwd acquire vocational and employment skills and techniques of delivery of vocational rehabilitation – constitute the core component of this book. The Author is not an Academician but a Practitioner. The Book contains Articles on different aspects of vocational rehabilitation. Almost all the techniques described in this book, have been practiced by the Author at some point or the other in his career. Some of them have failed while others have been extremely gratifying. The professional has to explore all choices in vocational rehabilitation and may be more. This is not an academic exercise but sharing of experiences, tailored to the needs of a VRW. A conscious effort was made to avoid high sounding language without compromising on the professional terminology, as – for most of the courses recognized by the Rehabilitation Council of India, School leaving certificate is the entry qualification (12 years of schooling). Not all the measures and practices described may be required for the vocational rehabilitation of a pwd but all alternatives are explained to equip the VRW with different techniques to meet different needs of different persons for successful empowerment of pwd. There is no literature available with focus on Vocational Rehabilitation in India. That is one of the reasons why not many specific references on bibliography are given and that is why the list of suggested Bibliography is limited and many are based in other countries. Acronyms, wherever used are designed to give quick and short cuts to commit to memory. Most of them are coined by the Author. Wherever it was by others, Bibliography gives credit to them. It is hoped more original material on Indian conditions are published for the benefit of the Vocational Rehabilitation Workers. The Author hopes this small effort would help the professionals understand the concepts better and guide them to use with the different categories of disabled and help them serve the disabled through the future professionals. As he enters his fiftieth year in the service of the disabled, this book is one more attempt to serve the disabled. The Book is dedicated to those thousands of persons with disabilities, who were the motivation for the Author to learn and practice proper vocational rehabilitation measures. 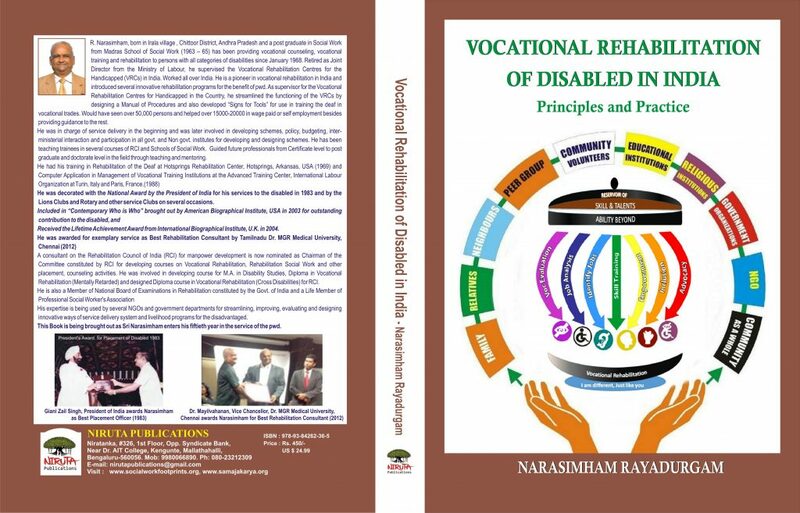 Book on “Vocational Rehabilitation of Disabled in India – Principles & Practice” written by me is scheduled for release on 11 June 2017.